Capacity 999 cc / 61 cu in. Front Wheel Travel 120 mm / 4.7 in. Rear Wheel Travel 130 mm / 5.1 in. Length: 2056 mm / 80.9 in. Dry Weight 169 kg / 373 lbs. Fuel Capacity 17.5 L / US 4.6 gal. For riders looking for an extra level of refinement, this is the HP4 with Competition Package. It's loaded with additional HP components: HP brake lever, HP clutch lever and the HP rider footrest system. The HP belly pan and the HP fuel tank trim are made of carbon fiber. It also features Racing Blue aluminum forged wheels and a sponsor sticker kit. The HP4 Competition also has the consecutively numbered fork bridge engraving with HP logo. This makes each and every machine unique. The Competition Package will be highly exclusive with very limited numbers available. For riders not content with race track performance alone, we proudly present the HP4 Carbon Edition. With its additional HP components it makes a striking impression: HP brake lever, HP clutch lever and HP rider footrest system. The long, closed HP engine spoiler, the HP plate holder and the HP fuel tank trim are made entirely of carbon. Its most conspicuous hallmarks are the aluminium forged wheels in Racing blue and the sponsor sticker kit - so its unique quality lies not just in its performance but in its design, too, making it a perfect synthesis of quality that is impossible to miss. The HP4 Carbon also has the consecutively numbered fork bridge engraving with HP logo. This makes each and every machine a unique specimen. Due to the involved manufacturing process and the limited availability of the high-quality carbon components, only a few models can be made during the manufacturing phase up to 2014. The new HP4 Carbon: uniquely exclusive. 3 Models to choose from! The lightest 4-cylinder engine in the segment provides uncompromising power with an output of 193 bhp and a maximum torque of 83 lb-ft. The new exhaust silencer provides a higher level of torque in the mid-range, so there is power available where it's needed most to deliver stunning lap times. With the world's first ever dynamic suspension system DDC (Dynamic Damping Control), the HP4 is the most advanced production sporting motorcycle ever built. DDC automatically adapts the suspension damping to the situation at hand. Various modes are available to choose from: Rain and Sport for public roads, Race and Slick for the race track. The further enhanced Dynamic Traction Control on the HP4 supplements this perfectly. It can be finely adjusted in Slick mode to dial in the perfect balance between system support and rider control. The result is transparent feedback, maximum traction and optimum acceleration. 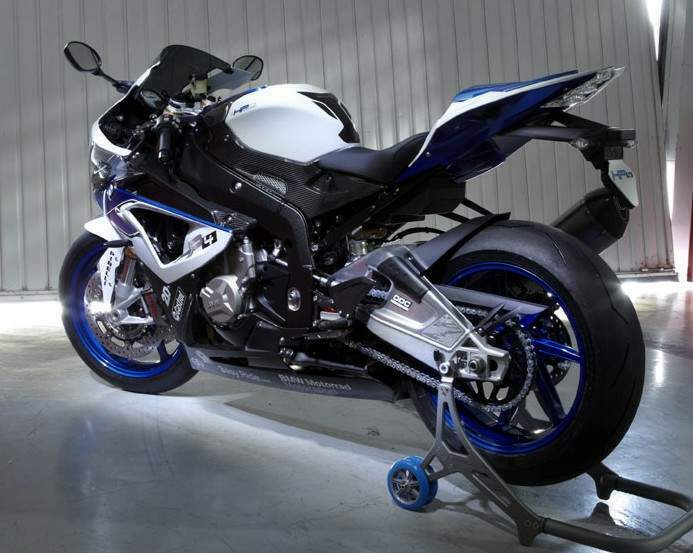 A few months ago I was lucky enough to ride the new BMW HP4 at its world launch at Jerez, southern Spain. With perfect track conditions and slick tyres to play on, it was a dream. More impressive still was the HP4. 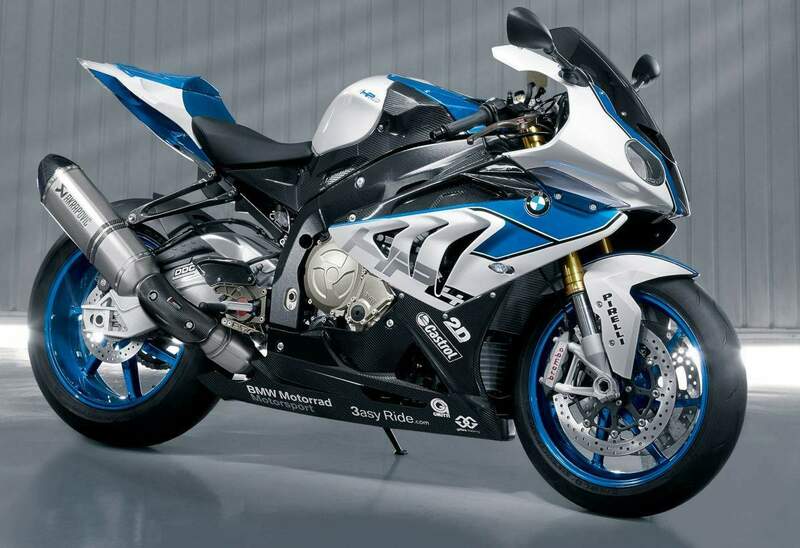 BMW has taken its already class-leading S1000RR and made it even better: 9kg lighter, more agile, smoother and even easier to ride fast, with refined electronics, larger brakes, fatter rear tyre, and beefier midrange. Then, of course, there’s its party piece: semi-active suspension. I lapped within two seconds of my best time set on my S1000RR race bike the previous year in similar conditions – not bad for a bike with lights and mirrors. Best of all, I never had to adjust the HP4’s suspension to achieve those times – it automatically gave me the optimum settings, so it handled as well as you could ever set-up a standard S1000RR. That’s a huge plus for most of us who don’t know our damping from our preload, but not a massive advantage for those who do. That’s all well and good on a smooth racetrack, and once you’ve got your suspension set, that’s more or less it anyway – you’re good to go. The real test of semi-active suspension was always going to be on the road, in ever-changing conditions. Can it cope with UK roads? So here we are on a late November day, 1500 miles away from Jerez. The day starts off freezing cold and wet, but the gods of speed have granted me a dry, sunny and mild window of opportunity – before it gets dark, cold and damp once more. If it wasn’t for my jaw being clenched with speed-induced concentration, it would be dragging on the floor – the HP4 has shocked me to the core. With all its power, refinement, light weight and grip, experience tells me to expect a warp-speed ride, like any other superbike – but the semi-active suspension gives me a riding sensation I’ve never experienced before. bumpy and littered with broken Tarmac. The most frightening bike I’ve ever ridden through here was an Aprilia RSV 1000R, which tank-slapped through just about most of it. Other superbikes are simply too fast along here – they just want to take off. The best bikes on this road are small nakeds, 600s, or the GSX-R750 at a push – in other words, bikes with more handling than engine. With its semi-active suspension, the HP4 seems to flatten the swoops and repair the broken Tarmac. It throws rose petals in its own path, for its Pirellis to glide softly over. Attack the same piece of road on the S1000RR and it’s just like any powerful superbike – the faster you go, the more you feel like the tyres are skating the surface, and the bars come alive in your hands. You’re riding with your fingertips, on the balls of your feet, with your eyes out on stalks. On the HP4 it’s the opposite. The faster you go, the more the tyres dig in and the more stable it becomes. Bars stay solid in your hands and the HP4 gives you the confidence to push the front ever harder into corners and twist the throttle sooner coming out. You’re hitting the throttle stop in places where it’s feathered on the standard S1000RR. Granted, the HP4’s new traction control, anti-wheelie, monobloc Brembo brakes and lightweight wheels are all helping magnificently, but it’s the semi-active suspension doing most of the work here. The clever suspension makes the HP4 handle better than anything I’ve ever ridden on the road. It’s a bold claim given the quality of bikes out there, but it makes sense – after all, who ever goes to the same lengths of setting up their suspension for the road as they do on track? Trying would be impossible anyway, because you’d never get a setting to work in all conditions – but that’s what semi-active suspension does for you, constantly adjusting to give you just about the perfect set-up in any freeze-frame of time. In that respect, it must be the ideal bike for the Isle of Man TT. You can’t actually feel the semi-active suspension doing its job, other than giving you this great handling, but there are clues it’s there. With the HP4’s engine switched off, the suspension’s default setting is maximum damping, so it’s like a block of wood to sit on. Once you turn the engine on, the suspension has zero damping, so you can bounce it up and down like a pogo stick. 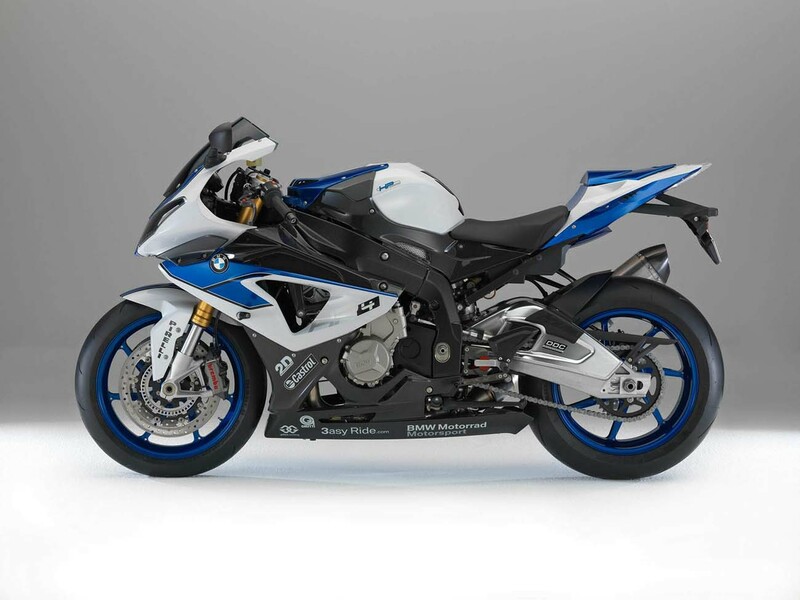 But once you’re moving, the suspension adjusts itself, via motors inside the left fork leg and rear shock, reviewing data from the HP4’s wheel-speed sensors, throttle position, gyros and rear shock movement by the millisecond. On the S1000RR, the front end gets lighter and the rear suspension squashes down as you go faster – and that’s what makes the steering go vague and results in the bars kicking in your hands over bumps when you’re pushing hard. But on the HP4, support from the suspension increases as speed rises. Not only have you got all this lovely control, but the ride quality is plush and sumptuous, too – like the very best racing suspension on a WSB or MotoGP bike on a track. The way the front wheel comes down from hovering wheelies over crests like it’s landed in double cream is almost spiritual. There’s no kicking from the bars over bumps, just a feeling of total grip and stability. Let’s not forget the 2012 S1000RR’s ride quality and suspension control is right up there with the best of any road bike. It’s familiar, plush and keeps the BMW on the straight and narrow, but every now and then you hit a bump that crashes through you, or a series of the buggers forcing you to slow down. Conversely, on the HP4 I’m actively seeking out the worst bits of Tarmac I can, but they melt away as soon as you run over them. In each of the HP4’s four riding modes – from Rain, through to Sport, Race and Slick – the suspension moves from soft to hard. In Rain mode, you start with a very soft ride and the suspension gets harder and softer within that zone. You also get full power, a soft throttle response and maximum intervention from the ABS and traction control. But you can tie the HP4 in knots in Rain mode – if you ride it hard, the soft damping slows the steering. So when you want to go faster, you simply switch to the next riding mode. As you move up through the modes, the HP4 gives you more controlled suspension and sharper steering. I ended up on Race mode, which gives excellent suspension control at high speed and crisp steering, as well as more direct throttle response, less anti-wheelie and enough ABS and traction control to give you a safety margin over damp patches. The only place the HP4 is worse than the standard S1000RR is at low speed, through slow corners, where the suspension goes soft. As the rear end sinks, the HP4’s steering feels a bit too lazy and chopper-like. But it’s a small price to pay for the advantages elsewhere. I didn’t try the HP4’s ‘Slick’ mode, because it wasn’t enabled on our test bike. Like all S1000RRs, you need to connect a plug under the seat to acknowledge the fact you’re entering a world of no rear ABS, limited traction control and ultra-sharp throttle. You can adjust the traction control on the left bar in Slick mode, too. Although the HP4 can cover ground quicker than the S1000RR, ironically it feels more like a road bike and less like a racer. 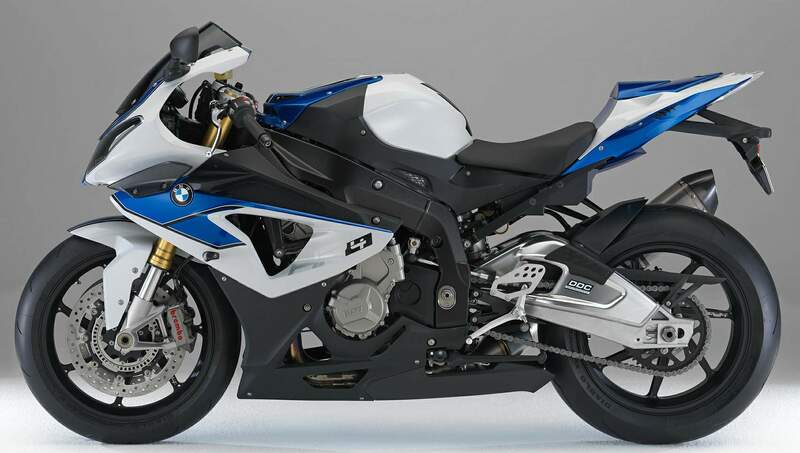 For most of the time the HP4’s semi-active suspension is actually softer and more comfortable than the S1000RR’s, because it doesn’t need to be any harder, and the steering is correspondingly lighter at higher speeds. The other main improvement over the S1000RR is the HP4’s new Brembo monobloc front brake calipers. Ultimate balls-to-the-floor, hard braking performance between these and the S1000RR’s two-piece Brembos is about the same on track, but the monoblocs have a far stronger, more tactile bite at road speeds, which is a welcome upgrade. The HP4 is littered with lots of helpful little nips and tucks compared to the S1000RR (see the ‘At a glance’ panel above), which make it slightly nicer and easier to ride fast on the road. But most of these things, like the adjustable traction control and lighter wheels, exist to help it lap faster around a track. The only toy the HP4 doesn’t seem to have, that I can think of, is an ‘auto-blipper’ for faster downchanges – the opposite of a quickshifter. They’re amazing, and it can’t be long before we see them on a road bike. But it has got heated grips, a godsend in this weather. Semi-active suspension really is the future. It allows the best suspension setting for every second of your ride. It really works. 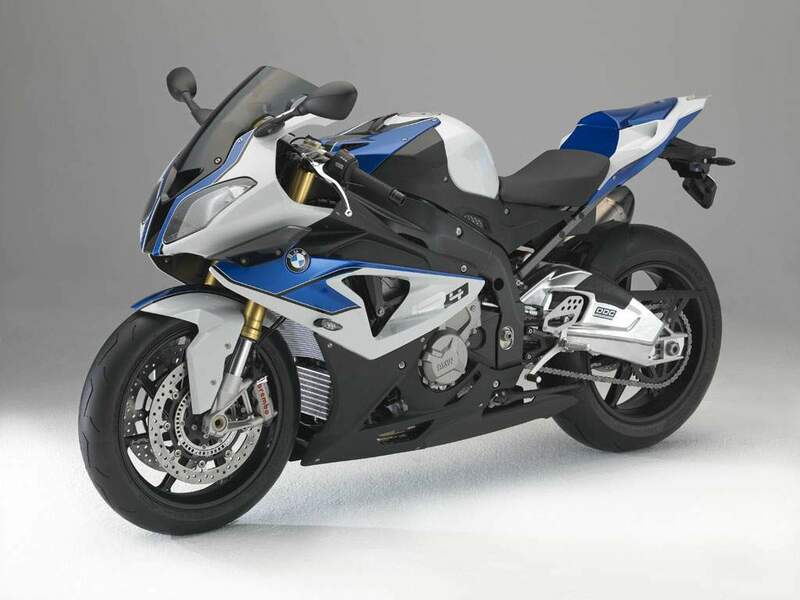 For the road, the HP4 offers superior grip and stability in comparison to the already brilliant S1000RR. It’s impossible to set your bike up perfectly for your favourite road – there are too may variables. And who could be bothered, anyway? That’s why the HP4 feels so good, giving you the kind of ‘soft here, hard there’ set-up you’ve never experienced before. It’s amazing. It works equally well on track, too, without you ever having to go through that whole trial-and-error process as you attempt to set it up yourself. But the irony is the HP4’s semi-active suspension makes it almost too capable for the road – and its limits are too far away. I was genuinely gutted when I packed the HP4 away at the end of the test. But in a way, I was glad, too - it’s a bike that’s far better used on the track. And here’s the paradox: the HP4 is too good for the road, but if you’ve got the suspension knowhow, you could set up a standard S1000RR equally well on track. 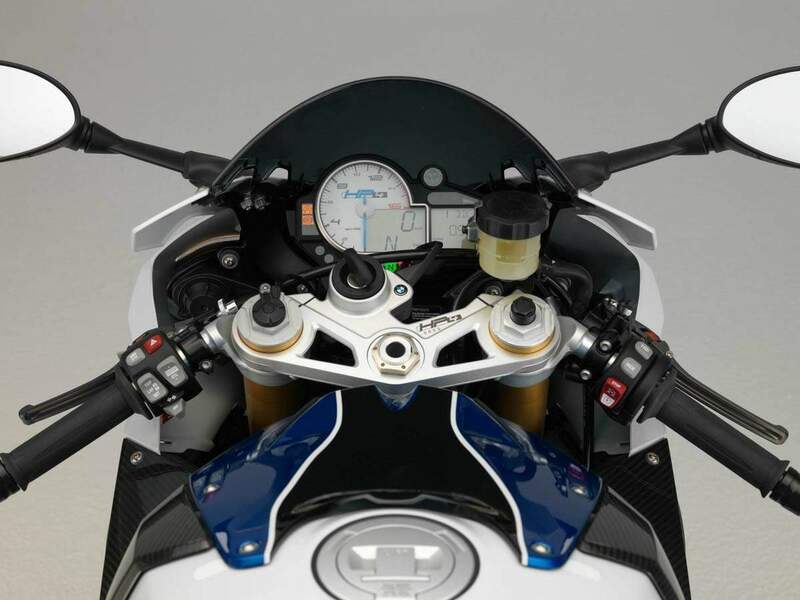 A good aftermarket suspension system will be better for racing, too, so the HP4 won’t be the ‘Second Coming’ for racers. But none of that matters, because it’s a dream bike, costing the same as a Ducati Panigale S. Very few of us will be lucky enough to own one, but if you’re one of the chosen few, rest assured there’s nothing faster – road, or track. Semi-active suspension will really shine when it filters down to less powerful and cheaper bikes. Fit it to something light and funky with no more than 100bhp and you’d be able to hold it flat-out everywhere. Now that is something to look forward to.